A snippet of life of 131 years ago from the Chelmsford Chronicle of 3 December 1882 shows how the lack of a welfare system could drive families into the Poor House of the Rochford Union. 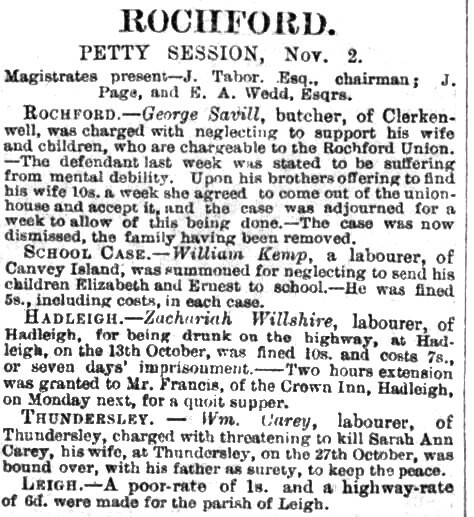 Luckily for the people of Rochford the sick man had a brother who would look after the poor wife and children by sparing ten shillings a week. In Leigh, at the time, they set the poor rate of one shilling and a highway rate of sixpence. A Canvey man would not send his children to school and Zachariah Willshire, labourer of Hadleigh, had been found drunk on the highway. Today he could have spent his time at the New Thundersley inn named after his family – the Zach Willsher. A generation or two earlier the Wiltshires or Willshers were landlords at the Woodman’s Arms on the Rayleigh Road. A Thundersley labourer, William Carey, was bound over to keep the peace, with his father as surety, for threatening to kill his wife Sarah Ann. This page was added by Robert Hallmann on 31/05/2013.